Magenta Skateboards and adidas have teamed up to pump out a killer capsule collection for Spring/Summer 2015, and if simple colorways with finesse are your thing you’re in luck. Donning a magenta and off-white aesthetic, these offerings are a perfect way to stand out against the bold S/S15 color palette. First up is the slept on adidas Skate silhouette that’s been doused in creamy suede uppers with select gold and magenta accents that ooze luxury. 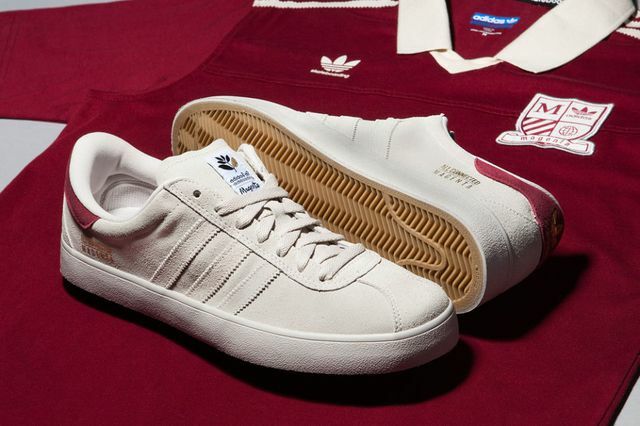 Details such as co-branded tongue-tags and gum soles set these apart from the others, all the while accompanied by a magenta jersey that features Magenta and adidas branding that perpetuates the magenta/off-white theme. You can score your Magenta Skateboards x adidas goods starting May 1st, mark your calendars now.